As I held Dr. Kiriti Sengupta’s little book in my hand for the first time, my instant reaction was, “Oh, this shouldn’t be too time-consuming.” I was right in that it took me just a few hours to read it but it is going to take much longer to savour the delight of the wine in it – the heady wine of love and spirituality; of a curious, contemplative and open mind; a large accepting heart – all embodied in the simple, direct words of the writer that make you enjoy and revel in this intoxicating cocktail of prose and poetry. A delightful experience as we take sips from his glass! It has already been mentioned by others that this book cannot be pigeonholed. As he says in the preface “When I wrote the manuscript I deliberately wrote down what came into my mind. I never considered what genre my book would fit into.” To brand it would be to diminish it. It is a distillation of some momentous pieces…autobiographical word snapshots, each followed by a poem. This book is Kiriti’s humble attempt to take poetry to all book lovers so that it can ‘reach its pinnacle again’. With great simplicity he tackles issues of love, spirituality, relationships, the world and nature as he perceives them and brushes them with his poetic sensibility. He cracks open little drawers and lets us peek into some uplifting moments of his life. The initial glimpse is into his first date with his future wife Bhaswati, which began on a slightly comical note that for him turned into the stepping stone of his literary journey. His wife to-be was quite amused when she asked him about a Rabindranath Tagore novel and he replied that he didn’t read poetry at all! Because the novel was “Shesher Kobita”! This honest revelation by Dr. Sengupta at the start of the book immediately endears him to his readers and keeps charming them till the end. The poet Kiriti was born from the agony of a painful relationship with a friend to whom he addressed his first poem in Bengali. While he says that with all its innumerable functions and facets poetry should also entertain, he believes that true poetry arises out of total consumption of one’s being. The second chapter from which the book takes its title shows us another side of Kiriti as he takes us along on a sacred trek. He is gentle but forthright in the weaving of this tale. We get whiffs of the wine that he imbibes spiritually and are given a peep into that part of his life which was experimental and experiential, culminating into the insightful observation that ‘red’- the colour of some wines and of blood – is divinely symbolic in Christianity, Tantric Hinduism and Islam. Whereas in Christianity, (to which he received formal baptism after the priest was convinced that he had attained spiritual baptism) ‘red wine’ is representative of Jesus’ godly blood sacrificed for mortals; Tantrics also use alcoholic beverages in their rituals and hold ‘red’ to be the colour of divine power. And so their attire is blood red in hue. With these he compares the Islamic ritual of animal sacrifice – ‘Qurbani’ – and draws the conclusion that ‘the elements of blood, power, alcohol and red (are) associated intimately with divinity”. “Blood Red”, the poem at the end of the chapter is a summation of this belief. The poetic vision he lends to his experiences and deep meditation on things we take for granted in our indifferent stride, shakes up our mental lethargy and prods us to reflect intensely on such matters. colour and its fragrance merge to call it/ a Rose. In the next chapter, Southern Affiliation he talks of his association with the southern city of Chennai (Madras), whose charms have bitten him affectionately. His affiliation is further enhanced by Mr. Atreya Sarma, to whom he devotes a whole paragraph and dedicates the poem “Clarity”. “Rains” is an allusion to situations that bewilder and hurt him; those thoughts, crowds, disciplines in which he tends to get totally drenched. These ‘rains’ have inspired poems from his haemorrhaging heart. His scientifically trained mind believes that love is “a strong cerebral affair.” It is the brain that rules the heart he feels and yet he says love is “a wonderful experience that enables you to feel your loved inside of you.” How beautiful is that! “My Master and the Cover” is the most significant chapter. He talks about his initiation into Kriyayoga by his beloved master; about Spiritual awakening through the rising Kundalini – the Divine Feminine force – whereby an aspirant experiences a ‘winy trance’. In the glow of his awakening he also tries to justify the cover design as substantiating Yoga in the light of literature, though there could be many different interpretations, as the designer refuses to explain his creation. But even as he exults in his Awakening he laments the moral degradation of the world and is grateful for his Master who helps him uncover the mysteries of life. As identical as ‘I’/through the slice of my sigh. Like the sky; where the stars shine bright and/ the Sun ‘I’. 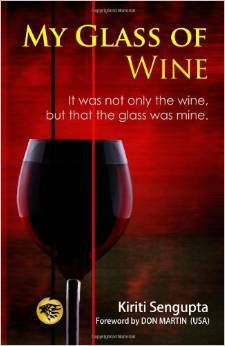 This entry was posted in book reviews, fiction review, literary news, Uncategorized and tagged Author's Empire Publication, book review, book review by shernaz wadia, kiriti sengupta, My Glass Of Wine by Kiriti Sengupta, Shernaz Wadia. Bookmark the permalink. Here it is. My bestselling title has been reviewed on the Fox Chase Review and Reading Series, Philadelphia (Pennsylvania, U.S.A.). A must read for all my readers who are but my roses! Thanks, dear Shernaz-ji for this wonderful review. I’m honored! This review of the highest quality has successfully instilled in me the urge for raising a toast to Dr. Kiriti Sengupta! I must fix MY GLASS OF WINE now! I can hardly wait! “My Glass Of Wine” has been absolutely intoxicating. Such piercing but affectionate are Kiriti’s renditions that I am still feeling a turn-turtle phase psychologically. Starting with a great introductory gateway (Foreword) by Don Matin I entered the speaking soul of Kiriti. The segments of his book are apparently link-less, but undoubtedly, this style puts a challenge before the readers – a challenge to find out the missing links. And there is the success of this creation. The reader is bound to read and search himself simultaneously while sailing through the stream of Kiriti’s utterings. After his unbelievably skilled narration of each section, Kiriti has placed a poetic-gem that silently metamorphosed the whole move into a rhythmic sky. As he starts his go with his honest confession of his first interaction with Bengali literature, he grabs the hands of his readers so softly that one would have no other option but to walk along with the author. The words of Kiriti bounce soundlessly, dance wavy and grips unbeatable. The intrinsic musical flow of his every sentence kept me mesmerized. And my my, what a pleasant view and analysis of poetry and its unavoidable associations! More I read, more I was enchanted with his thoughts. I was thinking with ultimate surprise if I have ever gone through such a literary experience which is firm but not dogmatic, spiritual but not religious and last but not the least, appealing but not demanding. This should be a landmark genre in the literary world, unmistakably different. My blissful wishes for this young and talented guy, going ahead with this glow of a lamp which he only can lit up. Heartiest congratulations to Kiriti Sengupta. A very wonderful review of a great work. While reading, My Glass Of Wine, I got the distinct feeling that I was listening in on a fireside chat. Occasionally, there would seem to be a natural pause where one would refresh themself within this conversation between souls. I expect one reading will not be enough to absorb the nourishment provided. Very well done! A Really well written review.It has gone a long way in directing the readers towards a delightful interpretation.An apparently simple book has been interpreted with critical insight and original reading. Excellent review of an Indian bestselling title! I have been associated with this book since its inception until it was executed. I have been the fellow mate of the author, Dr. Sengupta. He deserves accolades for bringing more readers to the genre called poetry. I appreciate his style of writing, his diction, his simple narratives, his down to earth poems that will touch the soul of the readers quite instantaneously. Sengupta’s treatment of spirituality is something beyond imagination; he does not press his readers, he does not even dominate, but he simply puts his points across the psyche of his readers. This is remarkable indeed! An author of his stature deserves more exposure in the United States, and I’m happy that FCR has provided this wonderful platform of sharing the works of Dr. Sengupta with the western readers. I will appreciate if someone from your team nominates Dr. Sengupta for various prestigious poetry awards, for he is worth the prizes that are given to the poets of high caliber! Creative writing and experimental literature are gaining global recognition in recent past. But enough most of them are nothing but word jungles. ‘My glass of wine’ is an exception. The book is a modest endeavor to highlight the author’s view on his own life and allied issues. Again, given the state of enlightenment and mental inertia among the basic human relationship and eternal feeling of humanity, the author intends to ventilate the critical issues of life in a simple way. Perfect amalgamation of prose and verse creates a beautiful atmosphere here. Actually, it is the matter of vision…. and the way you are synthesizing your life. I would like to congratulate Shernaz Wadia, for this nice review. Congratulations to a well deserved Global writer. Many Blessings. Thanks for wonderful review Shernaz.It may be difficult to fix the book into a genre, but its appeal is universal and content most intoxicating.Great work by Kiriti Sengupta. My sincere thanks to Shernaz for this beautiful review. She has rightly pointed out that,’ This book is Kiriti’s humble attempt to take poetry to all book lovers so that it can ‘reach its pinnacle again’. With great simplicity he tackles issues of love, spirituality, relationships, the world and nature as he perceives them and brushes them with his poetic sensibility’. Kiriti’s strength is the clarity of mind and the flow of his thought process. I have reviewed this book in one of the online portal where I mentioned ‘An excellent observer of the surroundings, Kiriti is content to keep it light (as if sipping a glass of wine) with minimum fuss, preferring his tales and anecdotes are rich in memory and valuable even it is explained to the outsider’. Shernaz’s review is enriched with details and traces the path of Kiriti’s journey in new light. The book has already hit the best sellers’ list and with good reason. Best wishes, Kiriti. Looking forward to your next book. Kiriti has a positive inclination towards doing something good for poetry and this review surely points at his smooth poetic expressions. Thanks to my readers and reviewers. Thanks, FCR! Let me share my experiences with the book by Kiriti Sengupta. A few months back I had to recite a few poems during a convention of the government teachers’ association in Tripura, India . I picked up “My Glass Of Wine” and I recited “Clarity,” a poem from the chapter “Southern Affiliation.” Surprisingly, I noticed that the ambiance of the auditorium changed, and the audience went gaga over my recital. Such had been the impact of that poem.